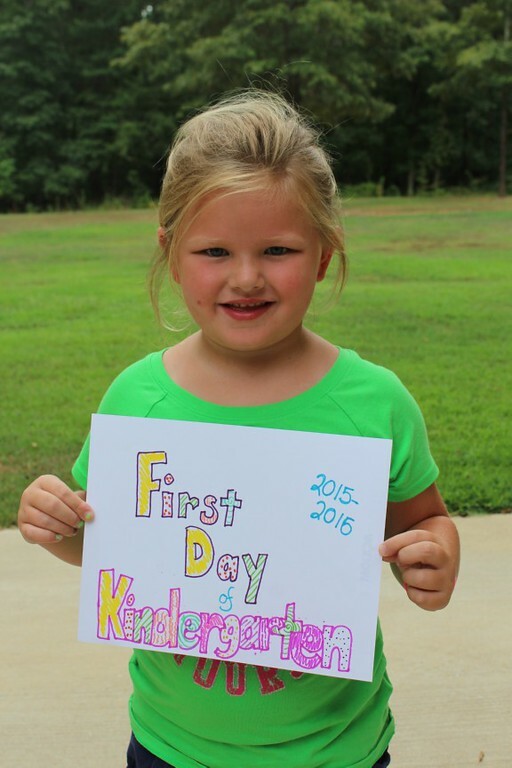 Adventures in Dennieland...: August 3, 2015-First Day of School! Campbell officially joins Home School! I was up early this morning trying to act like an adult and get things ready for our first day of school today. At about 7:15, I started waking everyone up and by 7:30, everyone was sitting at the table eating breakfast. Things were going splendidly-for the next few minutes and then school officially started (we are not doing our memory work and our science and history just yet). I have a schedule of who I work with at each hour (for example today was Campbell at 8, Graham at 9, Anderson at 10 and Reagan at 11) If I finish working with them early which is very probable, I then am able to help others during that time. Last year, I had plenty of interuptions so this year, there is no interupting when I am working with someone. I don't like having to call Robby and interupt his day and bum him out. But I definitely needed it today-thankfully I didn't lose my mind and was able to survive the morning. Who knows how but my Anderson was almost finished with his work by noon. Not so for Reagan and Graham. Those 2 were stumped with their math and I certainly regret not making them do a bit over the summer. We just pick up math right where we left off so there is no review and that proved to be a bit difficult. Next summer, we shall do better. At noon, we stopped our school work and started cleaning up downstairs and then did a few chores and ate lunch. Right after that, we loaded up and headed to a doctor's appointment for Graham. His ear has been bothering him for days-swimmer's ear was the official diagnosis so Robby picked up some drops and we are doctoring that ear of his. Once we made it home, the afternoon was spent finishing their school work. Lots of tears happened with their math but hopefully tomorrow will be better-if it isn't, we will go back to the basics! Supper and then down the road we went. This week is VBS at the little church down the road and my people couldn't have been more excited-Reagan even said that their VBS is better than than the VBS at our church. We dropped them off and Keaton could hardly wait to follow her teacher! Whitman wasn't too sure about things when we got back in the parking lot and he was the only one with us. He wanted to go back in and get Reagan and almost fell apart but I quickly turned Thomas on in the car and he was happy again. He even stayed happy as he was sitting in the chair getting his hair cut-another big boy hair cut for the boy. And he really was thinking he was something else while eating supper with Robby and me at Chuys. He was the only one with a coke and held it the entire meal. We then ran back home for about 5 minutes before going to pick up the kids. When it was over, Keaton ran up to me and said "it was so fun!" Glad that had a great time-4 more nights to go!